The Couchbase Autonomous Operator makes it easier than ever to automate the management of your Couchbase clusters. Learn more here. The Couchbase Autonomous Operator enables you to run Couchbase deployments natively on Open Source Kubernetes or Enterprise Red Hat OpenShift Container Platform. I'm excited to announce the availability of Couchbase Autonomous Operator 1.0.0 today! Running and managing a Couchbase cluster just got a lot easier with the introduction of the Couchbase Autonomous Operator for Kubernetes. Users can now deploy Couchbase on top of Kubernetes and have the Couchbase Autonomous Operator handle much of the cluster management, such as failure recovery and multidimensional scaling. However, users may feel a bit uncomfortable just sitting back and watching the Couchbase Autonomous Operator do its thing. 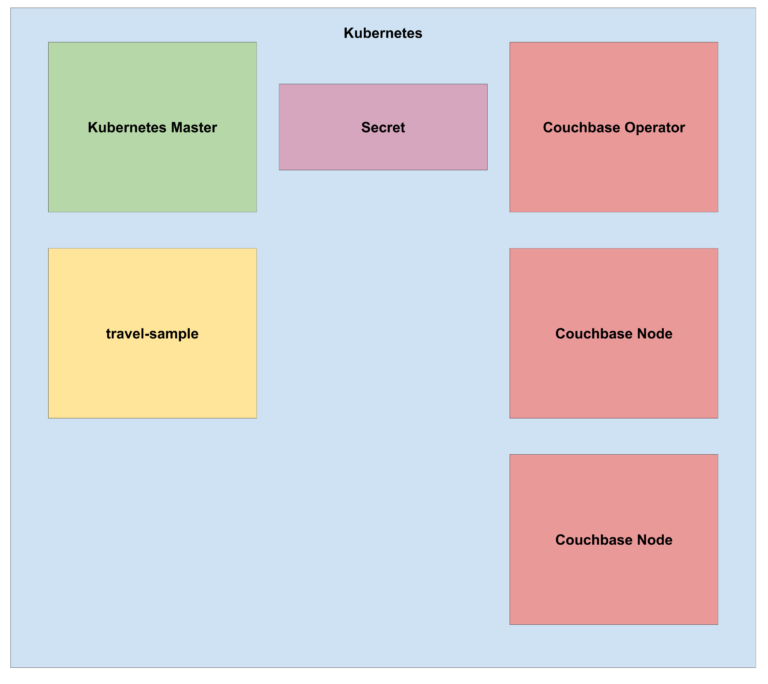 To alleviate some of their worry, this three-part blog series will walk through the different ways the Quality Engineering team here at Couchbase gives our customers peace of mind when running Couchbase on Kubernetes. This blog series will highlight three types of testing we do for Couchbase on Kubernetes. The first post in the series will focus on manual testing. The second post will be all about testing the Couchbase Autonomous Operator. And the third post will show our users how to test the Couchbase instances themselves with Testrunner, our functional test suite. Manual testing is often boring compared to the thrills of automated testing, but with Kubernetes it can actually be quite fun. In this post, we will walk through setting up the Couchbase travel-sample app with an operator-managed Couchbase cluster as the datastore, all on Kubernetes. Once the application and cluster are all set up on Kubernetes, we will test some scaling and failure scenarios. To set up that travel-sample app using Couchbase on Kubernetes, we will use minikube. Instructions for setting up minikube can be found here. Once minikube is set up, you may want to increase the memory and CPU count. You will need to bring up the Kubernetes dashboard to monitor the cluster using minikube dashboard. Submit this YAML to Kubernetes with: kubectl create -f path/to/deployment.yaml . After a couple of seconds the operator deployment should show up in the Kubernetes dashboard. Figure 1: State of the Kubernetes cluster after deploying the Couchbase Autonomous Operator. Next, a secret must be provided to Kubernetes so that the Couchbase Autonomous Operator can manage the Couchbase nodes. Send the secret to Kubernetes with the following: kubectl create -f path/to/secret.yaml . Figure 2: State of the Kubernetes cluster after scaling up to 2 Couchbase nodes. Now that we have a two-node cluster managed by the Couchbase Autonomous Operator, updates to the cluster configuration should be made in the cb-cluster.yaml file and resubmitted to Kubernetes. Should any changes be made manually through the Couchbase UI, the operator will take action to re-align the cluster to the configuration specified in cb-cluster.yaml. To make changes to the cluster, first make the changes in cb-cluster.yaml, then update Kubernetes with kubectl apply -f path/to/cb-cluster.yaml . The cluster is all set up now, but the travel-sample app is not. Now, we need to build a Docker image that Kubernetes will use for the app. The dockerfile below will pull down the travel-sample app from my fork in Github, and install all dependencies. The travel.py file has been modified for this blog post to use the Kubernetes Python client to grab the IPs of the running Couchbase nodes in the same Kubernetes namespace. Build the travel-sample app Docker image with: docker build -t your-dockerhub-handle/travel-sample:latest . The travel-sample app configuration is defined in the following file. Figure 3: State of the Kubernetes cluster after deploying the travel-sample app. Kubernetes, by default, does not allow access to pods from outside the cluster. Therefore, to reach the travel-sample app, a node-port service must be created to proxy the port on which the travel-sample app listens for incoming requests. Figure 4: State of the Kubernetes cluster after adding a node-port service. Figure 5: State of the Kubernetes cluster after scaling up to 3 Couchbase nodes. The Couchbase cluster is now 3 nodes, which is enough nodes to test the Couchbase Autonomous Operators auto-failover feature. Let’s kill one Couchbase node to simulate a failure scenario and watch the Couchbase Autonomous Operator automatically rebalance a new node back into the cluster. Kill one Couchbase pod by navigating to Pods in the Kubernetes dashboard and deleting the cb-example-0002 pod. Figure 6: State of the Kubernetes cluster after recovery from a Couchbase node failure. The Couchbase Autonomous Operator takes a lot of the hassle out of running a Couchbase cluster in Open Source Kubernetes and/or Enterprise Red Hat OpenShift Container Platform. The desired state of the cluster is maintained automatically even in the face of node failure. Manual certification of the node recovery feature is fun but more testing is required. In the next, post we will go through, in-depth, our functional testing approach for other features of the Couchbase Autonomous Operator. Published at DZone with permission of Korrigan Clark . See the original article here.